Cast of a Fenn cache bifce with the best over-shot flake. This is one of the more interesting bifaces in the Fenn cache because it has the best example of an over-shot flake removal. One flake removed nearly 4 inches (3 13/16 inches (9.7 cm) of an opposite edge. Another smaller over-shot flake can be seen near the point. The opposite side has an over-shot flake that measures 2 inches (5.1 cm) wide. 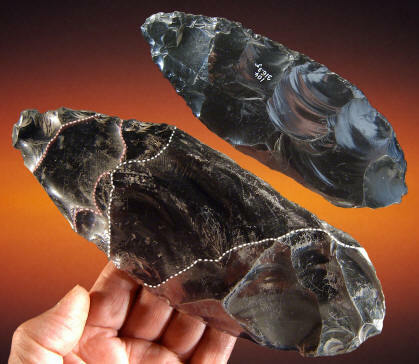 This biface is made of opaque black Obsidian and it measures 7 5/8 inches (19.4 cm) long.